Rural Planning Organizations were formed, by the North Carolina General Assembly, in order to involve rural county and municipal governments as well as the public in transportation issues in their regions. The ARPO is made up of of RPO administrative staff and two Boards; the Transportation Advisory Committee (TAC) and the Transportation Coordinating Committee (TCC). The TAC consists of one elected official from each County, one elected official from each muncicipality and NCDOT staff. The TAC is the policy making body of the RPO and is currently chaired by Pasquotank County Commissioner Lloyd Griffin. The TCC is made up of one planner or county manager from each county and one planner or municipal government manager from each municipality. The TCC is the advisory committee to the TAC. The TCC is currently chaired by Columbia Town Manager Rhett White. 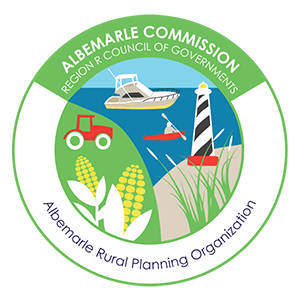 The Albemarle Commission has served as the lead planning agency for the ARPO since May 2002. Since that time, the RPO has been working cooperatively with the NC Department of Transportation, local officials and citizens to enhance transportation planning opportunities for rural areas in the ten county region. Providing a forum for public involvement in the transportation planning process. Participating in the merger process.